my healthy 8 yr old schnauzer just died...why? His name was Tybo and I don't know why he died. Two days after his 8th birthday I called him to come eat but he didn't come and I found him laying next to the couch unable to move. I got him up on the couch and he was in much distress. He was breathing heavily and within minutes he was gone. Could someone have poisoned him? I miss him so much and have never been in so much pain. NOTE FROM LINDA AND MAX: So sorry to hear of your tragic loss. Hopefully you will have many happy memories of Tybo and can at least console yourself with the thought that at least Tybo did not suffer. I'm sorry we cannot offer any real insight as to why Tybo died so suddenly. It may be like with humans, some of them may have a heart problem but know nothing about it and then they are gone, even though they seemed so fit and healthy. It sounds like Tybo was dearly loved and had eight happy years on this Earth, which is a lot more than many dogs. Comments for my healthy 8 yr old schnauzer just died...why? Hello, I am so sorry to read these stories and I understand what it feels like. 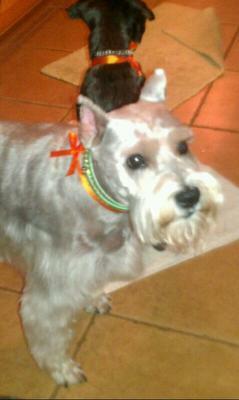 We just lost our Schnauzer Toby so suddenly and unexpectedly, I can’t believe he is gone. He was a kind and loyal soul, always happy, and never left my site and followed me (or whoever was home when I wasn’t) around everywhere. He was also healthy, lean, and very strong! We rescued him from a high kill shelter a little over 2 years ago, it was an owner surrender and he had a tumor so we rushed to take him out of there and treat him. The tumor was removed, biopsy showed it was just a benign tumor resulted from a hair follicle which was just never addressed on time by prior owners. I cannot believe someone could just get rid of such a loving, caring and intelligent dog. Very well mannered and with a huge heart. Toby lived with us for 2 years and became a part of our family. This passed Thursday, in minutes, he passed at the age of 6 without any sign of ilness or distress. He was home with my dad, left his side 5 minutes - right before I got home from work, and laid down under the office desk - his favorite spot. It is where I found him, breathless, and he had bowel movements passed so I immediately knew he was gone. I tried to hold him and checked if maybe maybe he was just simply not feeling well or still scared of the thunder and this is why we didn’t come out to greet me.... but no he was gone forever. I am so sorry to hear your sad news. It sounds like Toby passed his last years in complete happiness with you and, when the end came for whatever reason, it was quick. you did your best for him, God rest his soul. NOTE FROM LINDA: So very sorry to hear of your loss. Our thoughts are with you. It sounds like your Schnauzer had a lovely life with you, think of all of the good times. This is for Ed T. my mini started drinking water constantly leaving his bowl dry. didn't think anything of it until he started peeing in the house from drinking so much water, which he never did. We took him in and it ended up being diabetes. NITE FROM LINDA: thank you for sharing that. Diabetes is not uncommon in middle aged and elderly dogs. I have an 8 yr old mini Schnauzer. New behavior-Shakespeare has been drinking water outside from puddles, a small birdbath, a planter we have in the yard and from the hose when it drips. He eats all his food and runs around like he always has. I thought maybe he looked a little thinner than usual I love this dog and took him in for a regular check up. After some blood work/tests they said he showed signs of bacteria and his gall bladder fluid is thick. They did a sonogram today and there are no signs of cancer. They did say his labs don't look right. Has anyone experienced anything like this? Any info would be greatly appreciated. Good luck to you and Shakespeare. NOTE FROM LINDA AND MAX: So sorry to hear of your loss. It sounds like Tiffany's end was pretty quick and painless, which is what all Schnauzers would wish for - and she lived to a good age. Think of all the good times you had with her. Our thoughts are with you. So sorry to here you have lost Toby.. but the good thing is that he isn't in pain now and he is with many other schnauzers having lots of fun and good food.. I still miss my beloved Rebel1 and Ringo.. but I think of them being alive and with my beloved husband who is no longer with me either.. they are waiting for us to join them one day.. I have two more Schnauzers.. Rebel 2 who is 6 and 2 year old Benji.. also a wonderful Australian Silky, Rambo, who's 11 and thinks he is still a puppy.. !! please visit Rainbow Bridge where you'll see my story as well as others who have said good-bye to their wonderful Best Friends.. I'll not go on as I have a tear or two coming on.. NOTE FROM LINDA AND MAX: So sorry to hear of your loss. At least it sounds like it was quick and Toby would not have suffered. We lost our little schnauzer very suddenly. My girls let him out yesterday to do his bathroom business. He never barked to come back in. I had a client that came in shortly after that and mentioned that he was out in the yard. It was cloudy and overcast, not really hot, he was hydrated so I was puzzled. He had not acted right all morning and by 3:30 he had passed. I was working (home business) so I had to go remove him from the yard. I was just very upset and miss him so much. I've never had a dog quite like him. He was so pleasant, calm and well mannered. He followed me everywhere and was always happy to see me. The one thing I did notice was that the day before he died, he had accidents everywhere (very unusual for him....) I really am lost without my boy! I'm sorry for all of you that have gone through this. NOTE FROM LINDA AND MAX: So sorry to hear of your loss, and what a shock. Unless you have an expensive autopsy you may never know how Sarg died. He may have had a heart attack or a stroke, or his kidneys may have failed or something entirely different. It sounds like he had a wonderful life with you and that he was happy right up to his last seconds on this earth. My Alex was two weeks past his second birthday. Healthy as could be. We had just moved to Florida from Germany a week prior and he'd had an indepth physical exam for the move. He started breathing differently. It didn't seem quite like normal panting but was fast. He also just wanted to lie on the floor on his side and be left alone. We took him to the vet and they immediately began tests. He died within a few hours. The vet was so frustrated and perplexed that she asked for permission to do a necropsy free of charge. It turns out that he had a tumor in the base (atria end) of his heart. She said that while extremely rare, they do happen in mini schnauzers. They come out of nowhere and grow incredibly fast. So fast that the dog usually dies the day that symptoms begin. She also stressed that even if we had found the tumor prior to death that there is nothing that could be done about it. There aren't heart transplants for dogs and that is the only way that they could be fixed. I'm so sorry for your loss. Having been through what sounds like the exact same situation, I know the devastation and anger at having a young, healthy pet just drop dead with no warning. I hope you find a way to grieve this loss and understand that there is nothing you missed or could have done to prevent it. i to recently had a 7year old girl whom i miss daily .she died so suddenly i could not get her to the vet . i miss her so much she was very affecionate.i want another pet but it is hard to think of replacing her. I think Linda and Max could be right.. as your beautiful Baby could easily have had a heart problem.. and you will have known nothing.. he most likely didn't want you to know either.. Please go to the Rainbow Bridge forum as I've posted stories about my Rebel 1 and Ringo.. I lost Rebel 1 at 11 and he showed no sign of being poorly... when he did it was too late and 4 days later he was gone.. Ringo was 15, his passing was his age.. Don't leave it too long before you get another beautiful Schnauzer as he will fill your empty space.. You may not feel like it, but believe me it will help you in your grieving process.. to have another to cuddle and talk to..
My Sincerest Sympathy, and if you would like to keep in touch, my email is.. michele.lawrence@ymail.com I will email you the Rainbow Bridge poem too.. I looked on the internet and joined a Schnauzer forum the people on there are so friendly and supportive check it out on Google put in Schnauzer Forum I dont know where you are based but its a UK site. It is helping me a lot with my grieving process. I was so very sorry to read your post I can totally understand what you are going through as we lost our miniature schnazuer Ruby to cancer last week. We are devestated and miss her terribly she was very special to us and brought us much joy she was just 7 years old. We have another older schnauzer who misses her playmate too. I do truly know how you are feeling and I am sending you a big hug.